Mental Health Action Team: Leaders working on the OTOC Mental Health Action team had a full afternoon of meetings on May 14. In the early afternoon five leaders from OTOC and National Alliance on Mental Illness (NAMI) met with the executive director and program director of the Kim Foundation. The conversation helped the OTOC and NAMI leaders understand better the role that the Kim Foundation plays in fostering collaboration between agencies dedicated to providing mental health care to those who are in need. OTOC and NAMI agreed they would look for ways to participate in Kim Foundation events in the future. 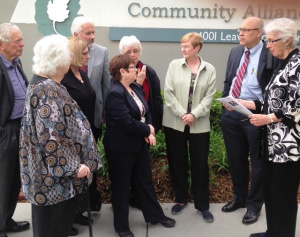 Later in the afternoon, 10 leaders from OTOC, NAMI and the League of Women Voters had a meeting with Carol Boye, Executive Director of Community Alliance, and Aileen Brady, the Chief Operating Officer. The leaders engaged in an informative and wide ranging discussion about the gaps which exist in the services provided to people with mental illness and their families. Through this research action, the group identified a several strategies to improve access to mental health care and supportive services that they will continue to research over the next several months. Contact the Mental Health Action Team chair, Sarita Penka at saritapenka2@gmail.com or come to the next action team meeting. Environmental Sustainability Action Team: The team supported passage of LB 469 which authorized creation of a State Implementation (SIP) by the Department of Environmental Quality to reduced carbon dioxide by 26% as required by EPA rules. This bill also authorizes an “Assessment” of the impact of this rule on the state, especially the economic impact of moving away from relying so heavily on coal. OTOC sought to have the assessment include the health benefits but this was rejected by Legislators. Finally, the bill authorizes preparation of a comprehensive, long term energy plan to guide energy policy. OTOC suggested that the bill require a public hearing process but this did not make it into the bill. This whole process will require ongoing vigilance. OTOC also supported LB 423 which would provide a production tax credit for Community Based Energy Development (C-BED) projects. The bill was filibustered at the last minute and no further action will be taken on it this session. Passage of LB 423 has the potential to lead to the development of many community renewable energy projects in Nebraska. There are several community and wind and solar projects that are waiting to see if an incentive will be put in place before deciding whether to proceed with development. LB 423 represents a positive use of tax policy to incentivize activities that are beneficial to Nebraska and its people. OTOC leaders will continue to support this bill in the 2016 Session. Housing Action Team: Leaders of the Housing Action Team are continuing to meet with local housing experts to develop new strategies to improve housing in Omaha. In recent months, OTOC leaders have met with a local developer who is a member of the Land Bank Board, a leading fair housing attorney, and the long time director of a large affordable housing non-profit. OTOC leaders have also recently testified at an April City Council meeting about the need for City of Omaha to increase the housing inspectors since the actual number of inspectors has dropped from 9 to 8 after the City’s settlement of a law suit by the Metro Omaha Property Owners’ Association. Contact Gloria Austerberry at glauster@yahoo.com for more info. 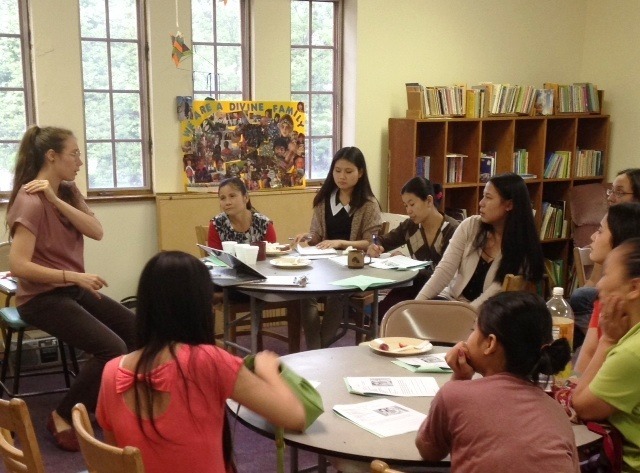 Refugee Women Leadership Academy Beginning in March, 2015, OTOC’s affiliate, Institute for Public Leadership (IPL) began a Refugee Women Leadership Academy to focus on specific issues raised by women refugees. The initial sessions have focused on Women’s Health Issues and How to deal with conflict. Thirteen refugee women have participated so far in these bi-weekly sessions which include dinner and interactive discussion with a female who is expert in the topic of the evening.